This tale has two settings…. During the age of the Black Death, we meet Jewish physician Alejandro Canches; Europe is devastated by the plague, and few have guessed the cause or how to avoid it. In the near future, we meet Dr. Janie Crowe, who lives with her small extended family group in isolation; a bio terror attack has laid waste to the whole world. Separated by six hundred years, neither doctor knows who can be trusted and who might be an enemy. While he travels through plague ridden Europe in the 14th Century, Alejandro Canches tries to wrest his adopted daughter from the clutches of her real father, King Edward of England. In the 21st Century, Janie Crowe possesses the original journal written by Canches, and treasures it not only as one of only a few remaining books, but also as scientific information that may aid her at some point in her work to fight this new global epidemic. Both doctors try to protect themselves and their families, while attempting to maintain their professional ethics. Ultimately, Crowe must fight for the life of her son, who is not only “the future” but who is also her deepest, darkest, secret. There are more connections running between these two eras than a journal, (but to talk about them would be an end spoiler). The book reads as one chapter from one era, then the next chapter the other era. This style keeps it very clear where you are, and you always want to finish one chapter to find out what is going to happen where you left off in the previous chapter. In other words, this is a real page turner. The tale of the 14th Century, however, is the much stronger, more descriptive story, and slightly overshadows the 21st Century. There were a few points where my disbelief was suspended just a little too far, but it was easy to forget about them in the richness of the story. 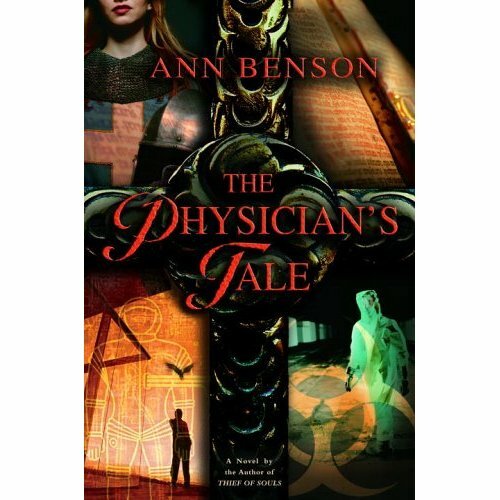 Titled The Physician’s Tale, this account does not resemble Chaucer’s. Geoffrey Chaucer does play a rather large role in the book, however, and it is fun meeting him. This is a great book, containing mysteries of science, history, and love. At 514 pages, it is a little long for a typical suspense/mystery novel, but it is well worth the time to read.